First-time online Pai Gow poker players can opt to use a “House Way” feature which will automatically set their hands using the same rules with which the dealer sets their hands. If you don’t know what you’re doing, then playing with house way is your safest bet, but it it may take some of the fun out of the game and wont necessarily give you the best advantage. There is quite a bit of skill involved in choosing the best way of splitting your hand and this helps in our view to make Pai Gow a very enjoyable diversion at an online casino. The biggest advantage live Pai Gow poker players have comes in the form of the banker/dealer position. While every player at the table will be charged a standard commission against their wins, the banker/dealer’s commission only comes out after the losses have been subtracted from their overall winnings per hand. Likewise, the banker/dealer has the advantage of winning all ties. Unfortunately, in online Pai Gow poker the house usually acts as permanent banker/dealer, eliminating that important advantage. Another way that players can slightly improve their winnings, when possible, is to prepay their commission every hand. This lowers the usual 5% commission to 4.76%. Unfortunately this option is also very rarely offered online. It’s important to learn what each online casino’s house way for setting hands is, as that may show you where you can get an advantage over the dealer. The number of hands that will be played differently than the house way are very few, making it easy to memorize the ones you will set on your own vs the ones you can use the house way feature to set. The majority of the hands you will set yourself will involve pairs, or more specifically splitting pairs. To split pairs is to send one to your High Hand and the other to your Low Hand. 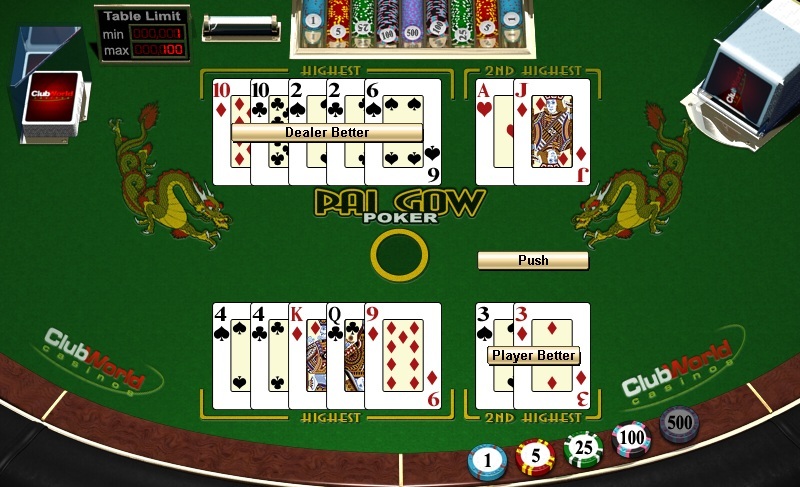 The following is a basic strategy for splitting pairs in online Pai Gow poker. Always split: two high pairs (with face cards or Aces). Always split: a high pair and a medium pair. Always split: two medium pairs (cards of 7 or higher in value). Always split if you don’t have a King or better for your Low Hand: all other pairs. When splitting two pairs, the highest pair should always go into your five-card hand. In instances where you have three pairs, the highest pair should go into your Low Hand with the remaining two pairs in your High Hand. Likewise, if you have a 6 or 7 card straight or flush, the highest card that can be taken without breaking up the combination should be sent to the Low Hand. As with all casino games you can improve your edge by taking advantage of any casino bonuses that are available. Picking the most favourable rules and playing optimal strategy can make a difference to the win rate.